An Asian citrus psyllid (ACP) was found on a trap in southern Arroyo Grande last week (identification was made by CDFA on 26 March, 2014). This is the first discovery of this invasive pest in San Luis Obispo County. After its first detection in California in August, 2008, ACP was found in January, 2011 in Ventura County, 7 November, 2012 in Santa Maria, and March, 2014 in San Luis Obispo County. CDFA will be working with Ag Commissioner in establishing a quarantine area and other actions to handle the situation. 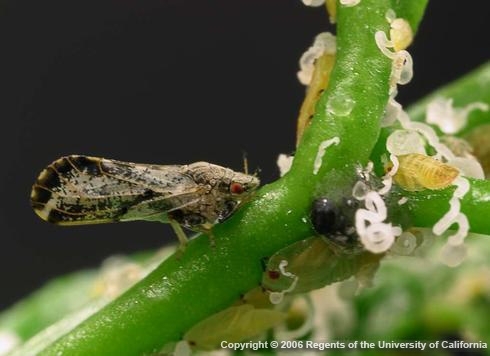 ACP is an invasive pest that transmits a devastating bacterial disease, huanglongbing (HLB) or citrus greening or yellow dragon disease threatening the California citrus industry. It is estimated that each year California spends more than $3 billion to handle exotic and invasive pest, disease, and weed problems. Exotic and invasive organisms are native to other areas or countries which are inadvertently brought to California and cause a major concern. HLB infection was found in a tree in Hacienda Heights a couple of years ago, where more than 20 infected twigs brought from another country were grafted to a backyard citrus tree. This was detected by CDFA and the tree was immediately destroyed. It is important for general public to be aware of the risk and refrain from bringing in plant material without a quarantine permit. Below is a short animated video made by Ellen Schofield and David Andow of the University of Minnesota that explains how invasive species become a problem in an introduced area. Management options for growers and homeowners can be seen at http://ucanr.edu/sites/ACP/. USDA ARS researchers in Fort Pierce, FL found out that exposing potted citrus plants for at least 48 hours to 104-107 oF reduced or eliminated HLB infection. Additional details of this study can be read at http://www.ars.usda.gov/is/pr/2013/130805.htm. My previous blog (http://ucanr.edu/blogs/blogcore/postdetail.cfm?postnum=4165) about this pest gives an overview of the pest biology and control. Current distribution of ACP, HLB, and the parasitic wasps of ACP in California can be seen at http://ucanr.edu/sites/ACP/Distribution_of_ACP_in_California/. Growers and homeowners with questions about ACP or HLB can contact local UCCE or Ag Commissioner offices. Citrus growers in Santa Barbara or San Luis Obispo Counties can also contact Cressida Silvers, ACP/HLB Grower Liaison of Citrus Pest and Disease Prevention Program at cressidasb@gmail.com or 805-284-3310 for additional information.